University of California, Davis has been home to the nation's largest pre-health conference for over a decade. Join us this year for the 17th annual UC Davis Pre-Health Conference, which will take place on Saturday, October 19, 2019, on the UC Davis main campus. 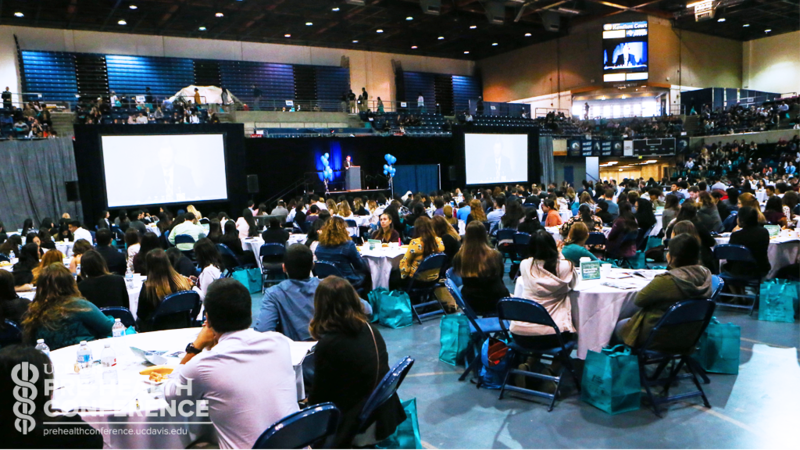 The 2019 Conference will host 4,500 pre-health students with varying health career interests, majors, and backgrounds from across the state of California. The conference hosts keynote speakers, deans panels, pre-health fair, and hands-on workshops covering a variety of topics from admissions to suturing. Attendees have the opportunity to explore a variety of health professions, including allopathic, osteopathic, podiatric, and naturopathic medicine, veterinary medicine, pharmacy, dentistry, nursing, optometry, physical and occupational therapy, physicians assistant, and more. The UC Davis Pre-Health conference has always been run by undergraduate students with the management assistance of Health Professions Advising. Some of the staff for the conference have been working for the conference for all four years of their undergraduate degree. See what some of them have to say about their time working with the UC Davis Pre-Health Conference. The UCD Pre-Health Conference was one of the most meaningful experiences of my undergraduate career. It became a part of me and I kept wanting to involve myself more and more because I saw what this event could do for others and I loved the camaraderie of working as a team with like-minded peers. This annual event holds a special place in my heart because it is a time and place where all health professionals from all walks and stages of life come together to share their experiences as a healthcare community. Having that positive community is SO important because we are able to motivate and support each other through the good and bad. I truly believe we can all achieve more if we work together. You have the past, present, and future of healthcare all converging in one space. It is such a unique opportunity to learn from others and collaborate ideas. My involvement in the conference has reinforced my desire and strengthened my drive to become a physician because I was able to witness the multifaceted field of not only medicine, but healthcare overall. Each individual contributes in different capacities to the health field, but being a physician to me means being a leader, mentor, teacher, friend, counselor, patient advocate, social activist, scientific researcher, all in one profession. There’s so much more I could list, but I hope to be all of those things and time after time, the Conference has continuously told me to never give up reaching for those goals. The Conference is truly what you make of it! Being a part of the UCD Pre-Health Conference team was a defining experience in my undergraduate career. It's incredibly humbling to be part of a team that is so dedicated in providing other pre-health students the resources and guidance they need to be successful in pursing their dream careers. I was a part of the conference team from 2013-2017. During those four years, I was able to develop my professional and leadership skills, in addition to cultivating my passion for mentorship and education. I was involved with the Pre-Health Conference for four years, beginning as a volunteer and ultimately serving as Coordinator of the Pre-Health Fair. It has been a true pleasure to work alongside my peers and Health Professions Advising staff to bring this amazing event to life each year. There is something so special about seeing all of the emails, meetings, phone calls, and physical labor come to fruition on that sunny fall weekend, as thousands of students across the nation flood the pointed white tents draped across the field. Walking through the fair absorbing fragments of the hundreds of conversations unfolding at once, catching the bright smile and handshake of a student and exhibitor of their dream school, glimpsing the wide eyes of an inspired first-year student realizing the endless opportunities in healthcare - these are just some of the moments why I hold this conference dear to my heart to this day. Throughout my four years, I have developed a trusting professionalism and sanguinity while establishing relationships with my peers, Health Professions Advising staff, and health professionals across the nation, that I would not trade for anything. So much of who I am today is because of this conference and the people who have continued to inspire me, and for that I am eternally grateful. I encourage anyone to get involved on any level, because I had no idea what this conference would one day mean to me, and you really never know until you try. My time with the UC Davis Pre-Health Conference was one of incredible growth. From working as a volunteer to becoming a member of the leadership team, I had the opportunity to collaborate with innovative minds in developing an inclusive and inspiring experience for pre-health students from across the country. I was constantly motivated by the passion and dedication of my peers and it was incredibly rewarding to see our hard work come to life each conference day. In four years, I formed invaluable friendships, developed my professional skills, and strengthened my passion for leadership and education. I truly would not be where I am today without the experiences, lessons and connections that I formed through coordinating this conference. It is an honor to be apart of the legacy of this event, and I look forward seeing the evolution of the conference as it continues to educate and inspire the next generation of health professionals. Having been a part of the UC Davis Pre-Health Conference for the past 4 years has been one of the best opportunities that I could have wished for in my undergraduate career. Not only have I found life long friends through this process, but I've enjoyed being a part of a conference that has made such an impact on the lives of many pre-health students all over the United States. What I enjoyed most about the conference was the collaboration and teamwork and one of the best qualities of this conference is that it is entirely student run. The students are the backbone of the conference and have continued to do a fantastic job at planning and coordinating one of the largest pre-health conferences in the country. I initially joined the pre-health conference as an intern to become involved in something outside of my academics. Soon enough it became one of the most valuable experiences in my undergraduate career. Being a part of something so big and incredible kept me motivated to continue on my path towards becoming a physician, and ultimately kept me wanting to continue being involved. It was truly an unforgettable experience being able to collaborate with students with similar career goals to help others attain some resources to reach their own goals. I would definitely recommend for others to get involved; I guarantee that the skills, memories, connections, and overall experience you will get from it is something you will not forget and will not regret! I look forward to my first conference as an attendee and cannot wait for what is in store for the future of the conference and of those I had the pleasure of working with.